Apricots are one of the finest dried fruits. They have an intense sweet-sour flavour and are an excellent substitute for out of season fresh apricots. Apricots are the fruits with the highest content of vitamin A.
They’re a good source of energy. By replacing a few servings of fresh fruit a week with smaller portions of dried fruit, you can work to increase your intake of dietary fiber, potassium, iron, and antioxidants. Dried apricots are also high in carotenoids and other potent antioxidant phytonutrients. 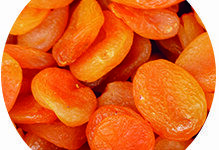 Dried apricot is widely used by the confectionery, baking, and health food industries.